Get the party started with this Shot Glass Roulette Drinking Game! Set includes roulette wheel, 2 mini balls with a mirror finish, 16 FDA-approved mini shot glasses and a starting guide. This drinking game makes for an excellent gift for white elephant parties or secret Santa! To ensure fairness the included balls are uniform and the roulette wheel is balanced. The diameter of the wheel measures 11.7 inches with a height of 1.2 inches. Each shot glass has a height of 1.7 inches with a diameter of 1.5 inches. The volume of each shot glass is 22.5ml. Care instructions: Wash shot glasses in hot, soapy water. Wipe the wheel with a clean damp cloth. To maintain the smoothness of the roulette wheel it is recommended to apply oil on to the spindle. 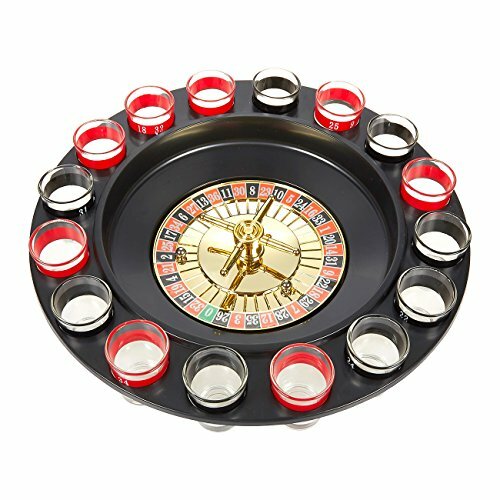 SHOT GLASS ROULETTE SET: Includes roulette wheel, 2 mini balls with a mirror finish, 16 FDA-approved mini shot glasses, and a starting guide. FUN DRINKING GAME: Spin the wheel and let it determine your fate! BALANCED & FAIR: To ensure fairness the ball is uniform and the dial is in balance. GREAT GIFT IDEA: Great for white elephant parties or secret santa! DIMENSIONS: The diameter of the wheel measures 11.7 inches with a height of 1.2 inches. Each shot glass has a height of 1.7 inches with a diameter of 1.5 inches. Volume of each shot glass is 22.5ml.